On August 26, the wine critic David Schildknecht and I visited Van Volxem to taste Roman Niewodniczanski's 2013s. 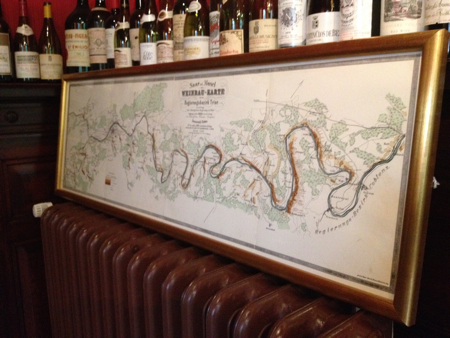 As we entered the tasting room, we were flabbergasted to see the rare second edition (1890) of the 1868 Saar und Mosel Weinbau-Karte (Viticultural Map of the Saar and Mosel) from Franz Josef Clotten, which was framed and resting on a heater by the entrance. In fact, neither of us had ever seen this print before. 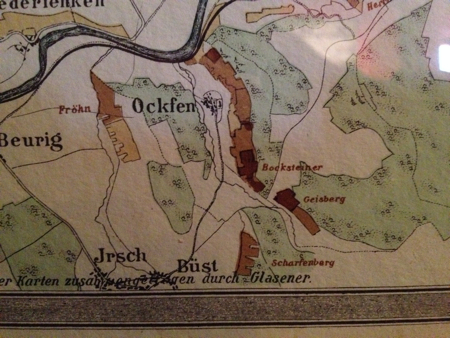 Unlike the first or the fourth edition (1906) of Clotten's 1868 tax map of the Saar and Mosel vineyards, the second edition has some green to indicate the forests. * It gives it more color than the other two maps. During the Mosel's heyday, new plantings on slate slopes expanded into side valleys, such as in Ockfen, Serrig, and Avelsbach, where the Staatsdomäne, or State Domain, started to plant more vines by the 1890s. These hillsides were covered in small oak trees and shrubs, called Lohhecken in German. Like the vineyards on the Ruwer, the wines from these areas were once called Heckenweine, or "hedge wines." 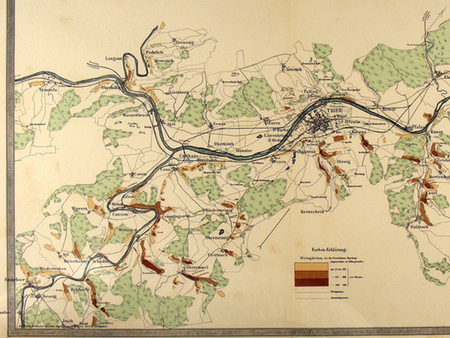 In the fourth edition (1906) of Clotten's Saar and Mosel map, there are new plantings on the Saar in Serrig (Schiesaberg, Würzberg, Eichenheck, Serrigertal, Vorm Wild, and Saarstein, among others), Ockfen (an expanded Geisberg), Ayl (Wald), Wiltingen (Schlangengraben, Acht auf Neuenberg, Giebelsberg, and Nilles), Oberemmel (Karlsberg), and Falkenstein (de Nysberg). The Mosel had new sites, too. Roman purchased the map at Antiquariat Peter Fritzen in Trier. This impressive antiquarian bookshop is located in an old mansion and has a sizable collection of old and rare books and maps. 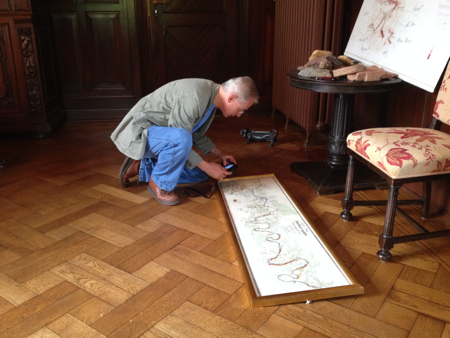 Unfortunately, Herr Fritzen doesn't have another original second edition of Clotten's viticultural map of the Saar and Mosel. And that's too bad. David S. and I would love to have even a copy of this edition. Unlike the first edition, Fritzen points out that the second edition doesn't have "Berliner lithogr. Institut" on the bottom right-hand corner. The main differences between the first and second edition are the new vineyard sites on the Saar and the addition of Sirzenich, a village to the west of Trier. The Moselbahn is on the second edition, including the station at Ürzig. This stretch of the railroad, which was called the Kanonenbahn ("cannons rail line"), was completed in 1879 (the two-track line in 1896). After the Franco-Prussian War in 1871, the Prussians wanted a railroad line to connect Berlin with Metz. This also helped the transport of Mosel wine. 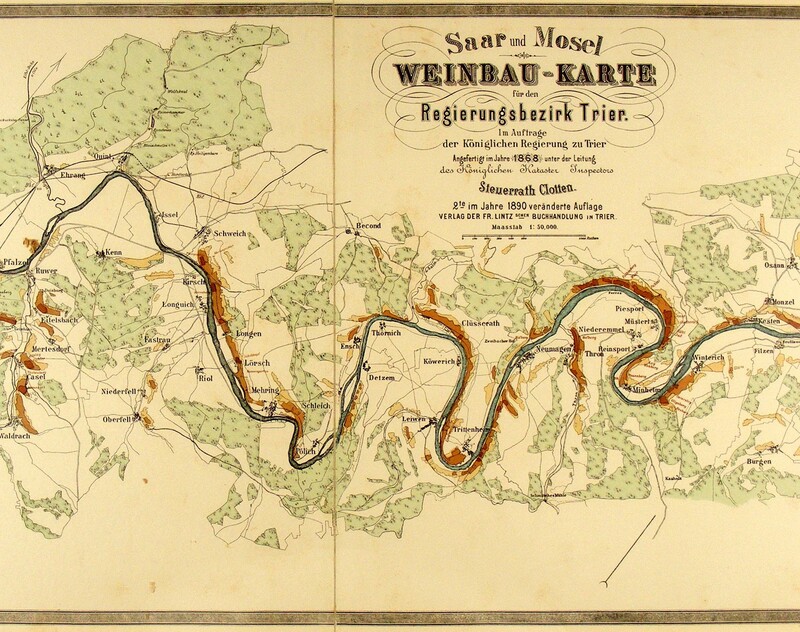 *It turns out that I had taken photos of the second edition (1890) of the 1868 Saar and Mosel map at the Trier library in February 2012. This original didn’t have the green, though. Evan, I haven’t really asked Roman at Van Volxem about it. On our visit in late August, I made the suggestion, but he didn’t say yes (or no). But there should be copies made, as with the first edition. I don’t need an original. It turns out that I had taken photos of the second edition (1890) of the 1868 Saar and Mosel map at the Trier library in February 2012. This original didn’t have the green, though. I forgot that I had seen it before and will add this comment as a footnote, too. 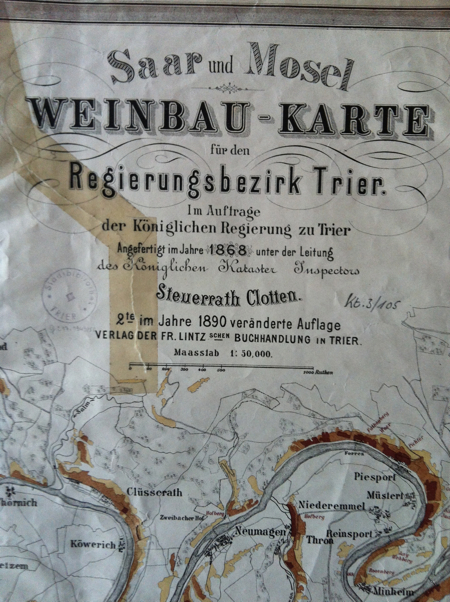 I told Frau Eich at the Trier library about the 1890 map. She will bring this up to the board members and see if they have interest in making copies of the original owned by Roman, who told me that he’s willing to let them use it.